Hello! 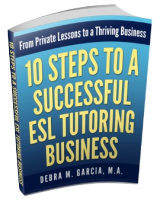 My name is Debra Garcia and I'm a private ESL tutor for adults. I'm also the creator and author of this website. Thanks for stopping by this page to read something about me. Teaching ESL to adults was a mid-life career change for me. It's one of the most fulfilling things I've ever done. And I've done many other things on my personal career path! In the past, I mostly worked for non-profit organizations (trying to "save the world"). I practiced law for about a minute. I was a full-charge bookkeeper for about a decade. Etc. All of these life experiences help me to be a better tutor to my students. As for my educational background, my undergraduate degree is in Sociology with an emphasis in Social Welfare. I also have a law degree and a Master of Arts degree in Adult Education. I have a TESOL certificate and (an expired) teaching credential. I started teaching ESL to adults when I was working on my Master's degree. Somehow, it was easy for me to get a California teaching credential and I was lucky enough to get a job at a public school for adults. I became the Life Skills counselor at the school and part of my duties were to teach life skills to various classes. I particularly enjoyed the ESL classes and that helped me to focus on what I wanted to do in the Education field. Eventually, I started my own ESL tutoring business. I love the flexibility I have and my students are great! Some of my students are professionals living and working in the U.S. They're trying to advance in their careers and have found that their English language skills are holding them back, so they decided to take lessons to improve their English. Some are students from other countries who are visiting the U.S. as scholars in their respective fields and are also here to improve their English. Some are new to the U.S., perhaps recently married, and are trying to improve their English to feel more comfortable living here. I've had an incredible variety of students and have immensely enjoyed the time I've spent with them. Teaching ESL also allows me to "travel vicariously." I love it. A few years ago, I started a blog about my personal experiences as a private ESL tutor. I received such great feedback from so many people, that I decided to start this website. In my blog, I included information about my tutoring sessions, lessons plans, grammar points, explanations of the grammar that we native English speakers never learned in school (or have forgotten! ), student needs assessments, and information on being a self-employed tutor (how to find students, where to advertise, where to hold classes, etc.). The blog format was limiting with what I wanted to do to help other ESL and EFL tutors and teachers. Plus the blog is free and you never know when it can just be taken away! I knew nothing, zip, nada, about building a website. SBI gave me all the tools and education I needed to not only build a nice site, but also to build one that people can actually find. With SBI!, I not only have a great website, but I also have a great online business that substantially supplements my tutoring income. In fact, it actually usually surpasses my tutoring income. If you're thinking about building your own ESL/EFL site, or any other site, I highly, highly recommend SBI!, especially if you're thinking of having your own online business. They have a money-back guarantee, but you won't need to use it. My goal is for this site to be the best ESL resource for ESL tutors on the web (or at least in the top 10!). It'll take a while, as this is a part-time endeavor. I'm continually writing material and updating this site. I hope you'll come back to visit often. You can subscribe to the RSS feeds listed on your left to be notified when I add something new. Also, if you have any suggestions, requests, comments, corrections, etc., please contact me. Thank you for reading and Happy Teaching!